Update: If you are using kernel 3.17, see the next post in this series for installation instructions; a patch is required! Good news, everyone! The new Catalyst 14.9 driver for Linux installs on Fedora 20 using the latest kernel (3.16.3-200 at the time of writing) without the need for any patching. Simply download and execute the installation package amd-driver-installer-14.301.1001-x86.x86_64.run. Of course, one must still meet the necessary prerequisites and, as far as I know (I haven’t tested yet), one still must remove the GNOME desktop environment as described in the previous post which describes the installation process for the Catalyst 14.4 driver. Fantastic! No more need to stick with the old 14.4 RC for my APU. Let me know if you have problems with 14.9 which I haven’t covered! 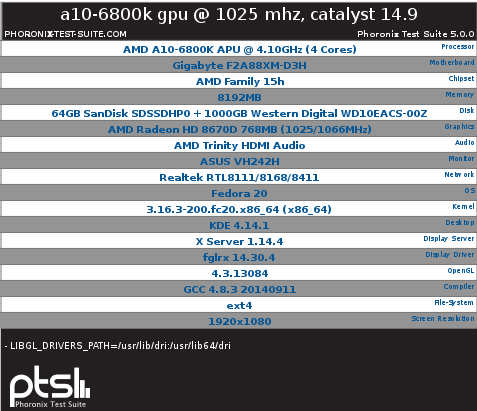 This entry was posted in Information Technology and tagged AMD, Catalyst/FGLRX/Crimson, Fedora, GNU/Linux, kernel. Bookmark the permalink. It worked for me as well UNLESS I applied the patch. After that it didn’t work for 3.16 version of kernel. Update: I, too, can confirm that installation without patching is successful. Awesome! I have modified the post to reflect these findings – thanks for the heads up! When I applied the patch all I was getting is the default_policy.sh failing with unexpected output. Without the patch it worked perfectly fine. Realy nice to have a newer stable version of flgrx, but since Fedora 21 is almost there and it will run wayland wil it be compatible with fglrx? Or I’m wrong and F21 will not run wayland? Hello, I am trying to install the package in my Fedora 20 but during the installation it ask me for the distrobution that I have. The only options are RedHat or Suse, I tried redhat 7 and the 64a but it gives an error. I’m not sure at what step in the process you’re receiving that error. I am never asked for the distribution I am using. Can you list the steps you have taken which produces the error? gave it the permissions before that and that’s it. Thanks for this! I can confirm that it works with XFCE as the only desktop environment. I also used the patched version. I did have to take out ‘nomodeset’ from the grub configuration, otherwise graphics wouldn’t load (however ‘nomodeset’ was necessary to avoid blank screen when the proprietary driver wasn’t installed). First off thanks for the the post. It is very helpful. I was able to install AMD Catalyst 14.9 on Fedora 20 running 3.16.6-200 without any errors. This is on an HP Zbook on a docking station with 2 external monitors. A monitor connected to the VGA port woks as expected. However, a monitor connected to either of the two DP ports turns on and shows the desktop and I can move the mouse on to the DP displays but not open windows on them. Also xrandr always shows the DP ports being disconnected. I’ve spent the day playing with xorg.conf, amdcccle and goolgle without success. Any ideas to get the DP ports working correctly? It worked great without patching, until yesterday when I updated kernel to version 3.17.2. Fortunately, I have found and applied this patch: http://ati.cchtml.com/show_bug.cgi?id=1117 and now it works again on my Fedora 20.